The biggest taco-related opening of the year has revealed itself in the form of PettyCash, a brand new postmodern taqueria set in the space formerly occupied by John Sedlar's Playa (and Neal Fraser's Grace, before that). 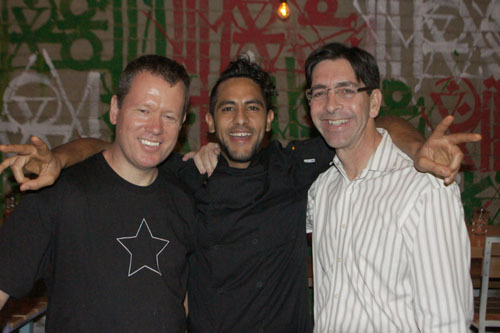 The Bill Chait-backed (Sedlar is still a partner) restaurant features a menu by Walter Manzke (whose transcendent pig ear nachos at Test Kitchen perhaps foreshadowed his role here) and taco Wunderkind Guillermo "Oso" Campos Moreno from Tijuana's Tacos Kokopelli, with local blogger Bill Esparza running interference. PettyCash officially opened on May 21st after weeks of "secret" password-requiring preview dinners, and is walk-in only at the moment. Playa's former digs have been chopped and screwed. Though the basic layout remains, one side of the 150-seat room is dominated by a wall mural by graffiti artist RETNA, while communal benches have been installed, and the oft-ignored back room brought back to life with high-topped tables and shuffleboard. The vibe they were going for is described by marketing materials as "Tijuana circa 1986 meeting East LA circa 2013." PettyCash's menu reads well, an of-the-moment interpretation of street food that Manzke and Campos are quite proud of (and indeed, it includes some of the latter's standbys from Tijuana). Tacos are meant to be the focus here, but there's a strong cast of supporting players as well, including those aforementioned oreja de cerdo nachos. The libations are equally as engaging. 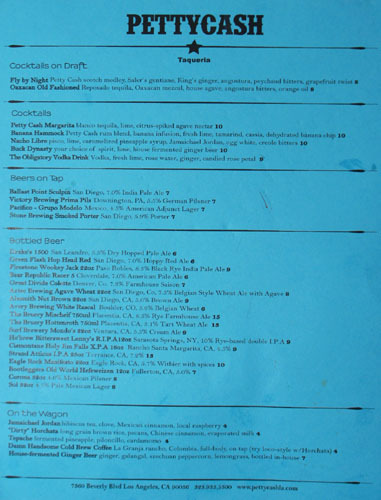 Given that this is a Bill Chait joint, cocktails are overseen by Julian Cox and are definitely worth a try; the beer selection is pretty damn respectable too. Also, be sure to pay special attention to the array of Mexican spirits on offer (Esparza's area of expertise I understand): tequila, mezcal (the new tequila), sotol (the new mezcal), bacanora, and yes, even raicilla (you'll probably have to look that one up). Click for larger versions. Housemade chips were gratis, as were the two salsas: one tomatillo, and one spicier, smokier variant. 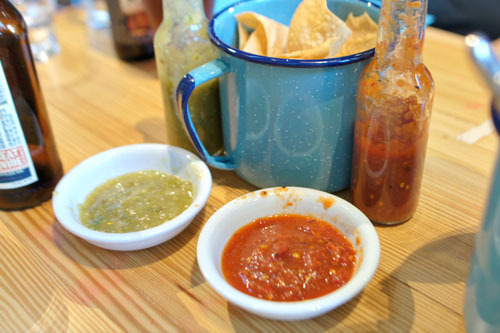 Interesting note: during previews, there were apparently three salsas provided, so I'm not sure why one was removed. Perhaps inspired by Kokopelli's famed "Black Harder" dish, our first course of the evening managed to be one of my absolute favorites. I loved the unexpected, almost disconcerting tint of the sea bass here, and how it melded seamlessly with the simultaneously earthy, nutty, and spicy notes at play. There was just a fantastic depth of flavor here that really made the fish sing. 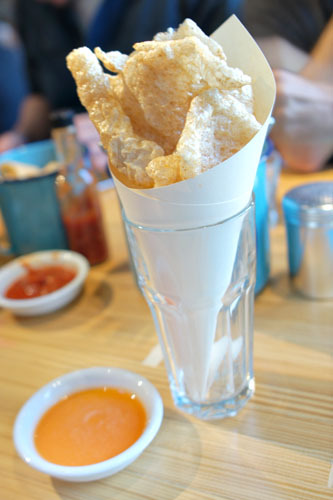 Chicharrones were marvelous, the best pork rinds I'd ever had in fact: light, airy, and utterly crunchy, with a superb savoriness to boot. They were delicious alone, but the hot, sweet sauce was the perfect accoutrement, popping and crackling upon being slathered on the fritters. Manzke served this a while back at his stint at Test Kitchen, and it sort of blew me away back then. I'm happy to report that the dish is back in full force at PettyCash, and is still the best version of nachos I've ever eaten. 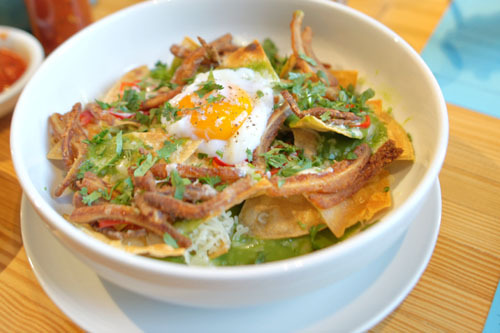 The pig ear was clearly the star here: crisp, chewy, and undeniably pork-y little slivers that balanced beautifully against the zesty nuances of the cilantro and crema, while the chilies added just a whisper of heat to things. If that wasn't enough, the egg imparted further luxuriousness to the dish (a runny egg makes everything better right? ), making for a delectable amalgam of tastes and textures. A must try. 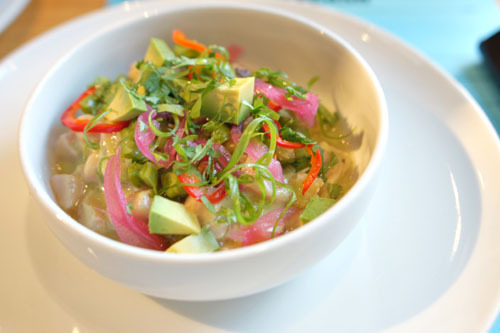 Now this was a new one: pork, but in ceviche form. I didn't even know you could do that. The dish really turned out quite well though. I loved the texture on the meat, which was firm, yet supple, yielding. It was almost like a dense fish, and indeed, functioned just the same here, serving as a great base on which the countervailing flavors of cactus, onion, and avocado could really dance. Give it a shot. 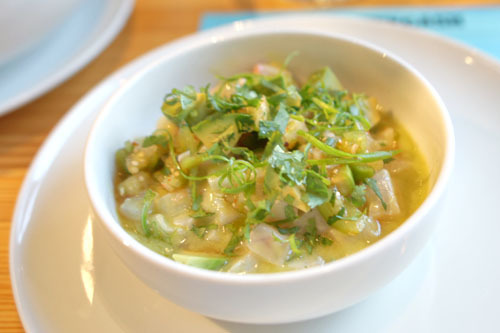 Following up on the pork was a much more conventional ceviche featuring kampachi. The fish was great texturally, and the sour, tangy, yet slightly sweet flavors were classic in essence, yet undeniably effective. 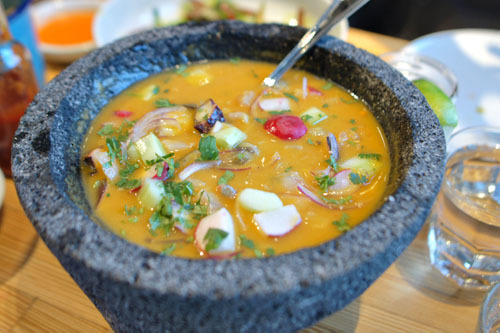 Next, Manzke sent out an impressive molcajete (or mortar) filled with aguachile and a number of mariscos: Kanpachi, Kumamoto Oysters, Littleneck Clams, Octopus, Gulf White Prawns, and Live Santa Barbara Prawn. I quite liked the presentation, with the sweet-spicy-sour broth balancing and highlighting the distinct, ocean-y flavors of the seafood, each of which contributed to the textural mélange here. 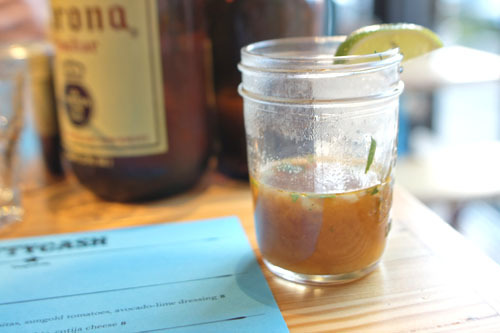 Pairing with the aguachile was a delightful mason jar of bichi, an intense, multifaceted, and quite profound seafood broth that provided a palpable heft to go with the levity and whimsy of the main dish. 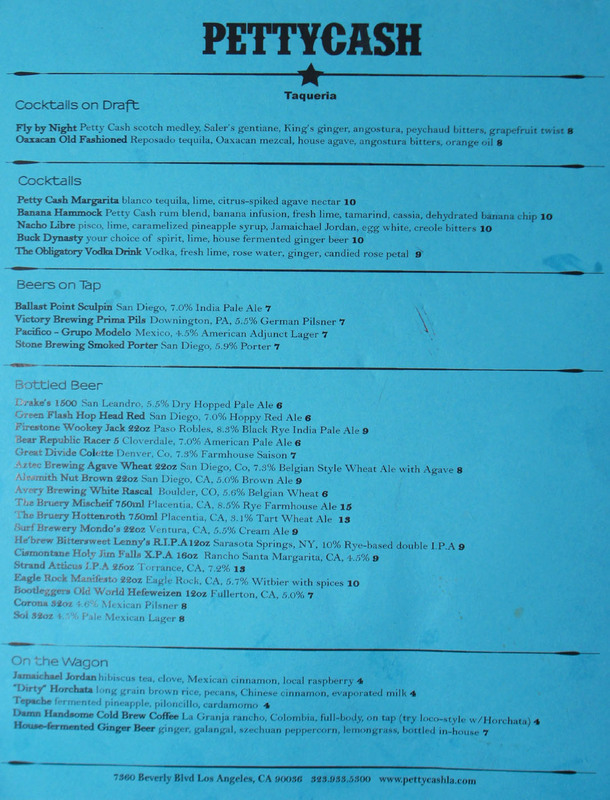 Naturally, we had to try each of the seven cocktails on the menu, the first of which arrived "on draft." It really was like nothing that you'd expected from a Mexican joint; in fact, I'd had a handcrafted version of it not long ago at Sotto! Redux notwithstanding, this was a weighty, boozy concoction that deftly played the base of Scotch against the citrus-y, bittersweet, and spicy influences present. Nice. 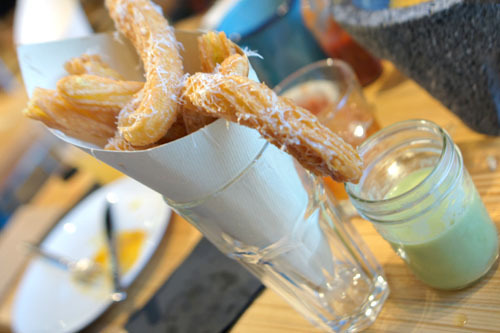 The popular cheesy churros tasted exactly as advertised, giving us the crisp, yet creamy texture of a churro, with a savory tinge. I actually enjoyed eating them alone, but my dining companions appreciated the slight sweetness in the accompanying dip. 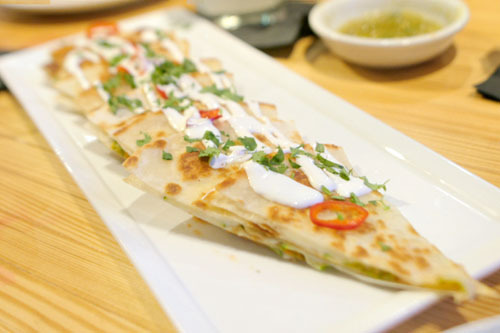 A deep-fried quesadilla was a fun little dish. For me, the prawns here were more for texture, with the quesadilla showing off sort of a general savory character that paired in classic fashion with the smoky, spicy salsa and light, crisp shards of cabbage. Tasty. 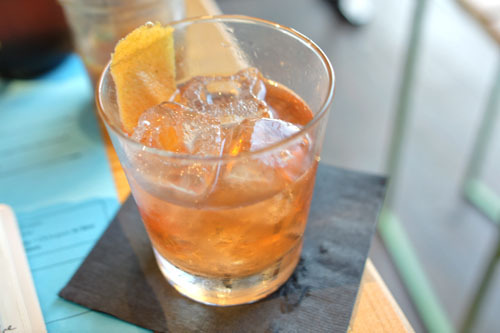 The second "draft" cocktail, the Oaxacan Old Fashioned, was a south-of-the-border riff on the classic, with the smoky weight of the mezcal forming the main thrust in the drink, set off against the citrus notes present. The requisite Petty Cash Margarita, meanwhile, was pretty much a standard version of the traditional cocktail, but with the addition of agave nectar. It was actually quite delicious and well-integrated, with a lovely balance of sweet and sour nuances over a base of tequila. Last up was the whimsically-named Banana Hammock, which was as tropical as its name (and appearance) would suggest, with a marked banana fruitiness joined by a good amount of sweet, aromatic spice--definitely deserving of its umbrella. Next up was an expert rendition of the ubiquitous "American" style quesadilla. It was a comforting, familiar dish, with a delightful cheesiness to it that paired well with the slight crunch of the four tortilla, all while the crema offered up a countering tanginess to things. 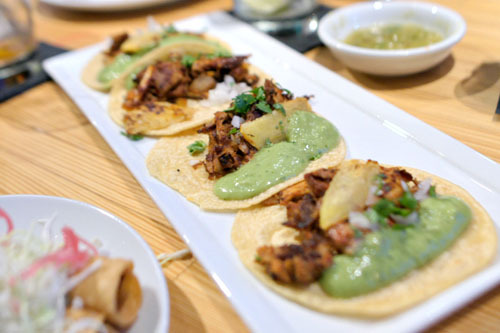 Our first set of tacos brought us the al pastor, which gave us some tasty bits of chile-imbued pork that worked well enough against the piquant counterpoints of onion and avocado. My concern was that texturally, the meat just sort of blended in with everything else, and needed to stand out more. 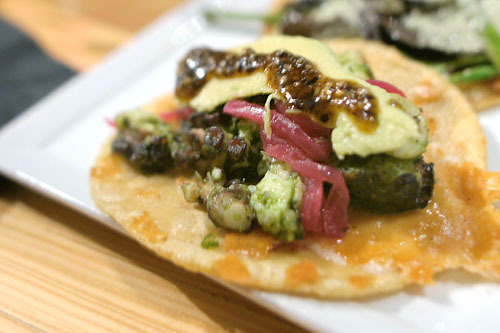 In terms of consistency, the star here was the tortilla, a blend of supple and crispy that really made my day. 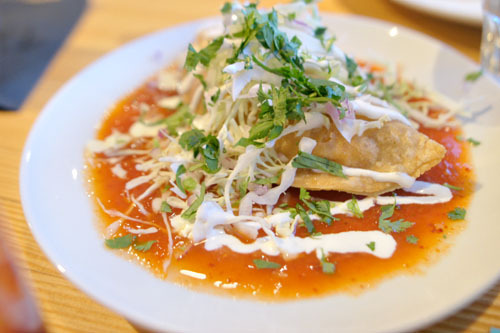 The tacos dorados were reminiscent of the flautas that I sometimes pick up from my local Mexican joint, not necessary a bad thing mind you (especially since they're basically the same price!). 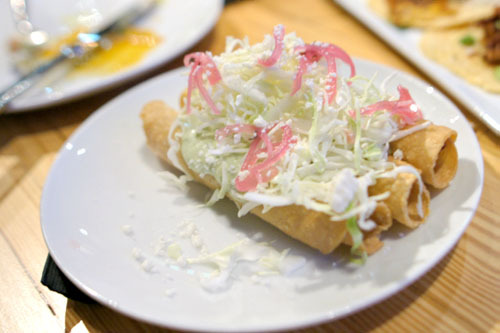 It was a classic interpretation of the taquito in effect, a blend of a savory potato filling and super crunchy tortilla wrapper that made absolute sense when taken with the avocado and shredded cabbage on top. Our last round of cocktails brought us the last three on the list. The aptly-named Obligatory Vodka Drink (is vodka the red-headed stepchild of the liquor world now?) 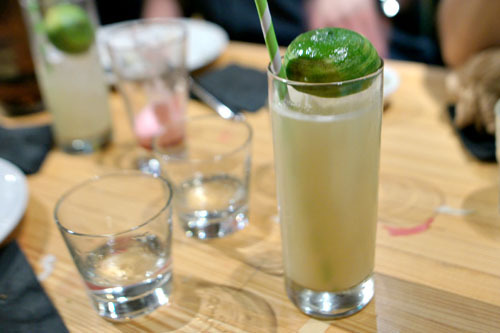 was better than most fortunately, with a refreshing ginger tang to go along with the aromatic qualities of the rose. 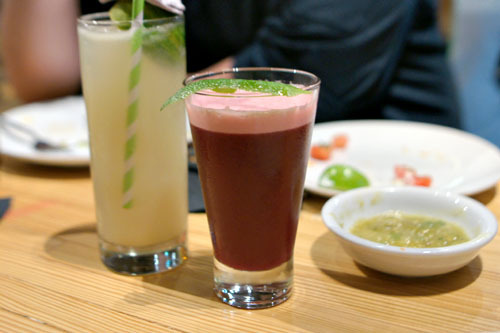 The Nacho Libre, meanwhile, was quite intriguing, featuring a wonderfully sweet, spicy, floral base of Jamaichael Jordan (hibiscus tea, clove, Mexican cinnamon, raspberry) that reminded one of my dining companions of a "wax candle." Last up was the Buck Dynasty, which came in our choice of base spirit. Naturally, we let the bartender decide, and were given mezcal. It wouldn't be the first liquor to come to mind for me, but it actually worked out really well, with the booze imparting a smoky undercurrent to the drink that melded seamlessly with the bright, sour tastes at play. 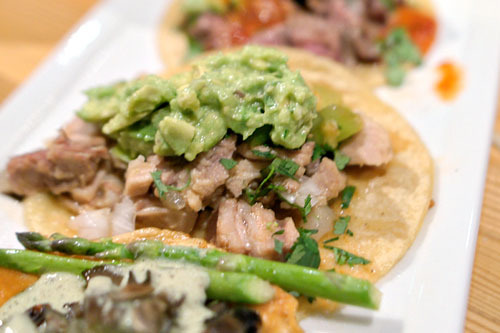 Getting back to the tacos, the carnitas variety was very, very pork-y, with a surprising intensity to it that was set off beautifully by the piquancy of the salsa and guac. Texturally though, I would've liked some crispy bits as well, as those browned edges are certainly part of the joy of eating carnitas. The "Kraken" was probably the dish most literally translated from Kokopelli's repertoire, and for good reason it seems. It was one of my favorites of the night, with the octopus arriving just tender enough, with a lovely char and a palpable potency to it, gorgeously foiled by the spicy pricks from the arbol chile. If you get only one taco, make it this. 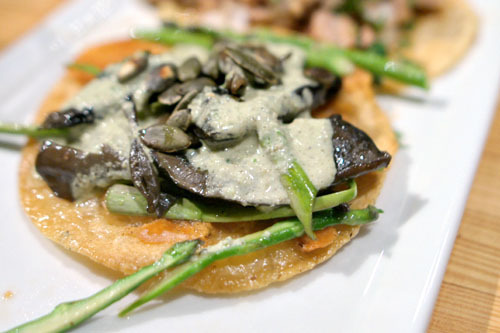 I don't think I'd ever had mushroom as a taco filling before, which, after eating this, is a shame. The earthy, salty, savory character of the portobello was nicely conveyed here, keenly moderated by the slivers of asparagus thrown in, while texturally, the 'shrooms were spot on as well. A very appealing vegetarian option. 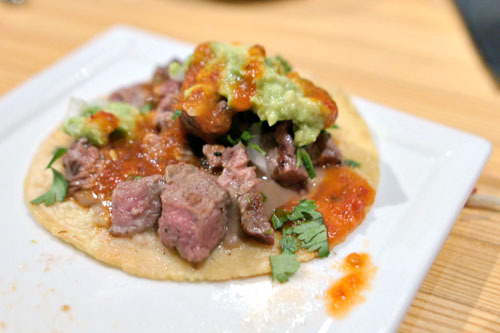 The carne asada taco, unfortunately, was my least favorite of the bunch, as I found that the meat itself actually got overshadowed by the other components here. The beef really needed to be the hero in the dish, but got a bit lost among the beans and avocado. 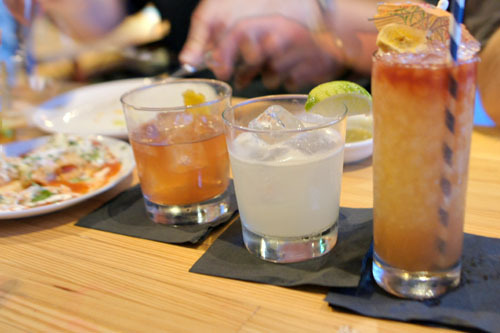 With the cocktails out of the way, we made sure to sample PettyCash's much-bandied about artisanal Mexican spirits program. 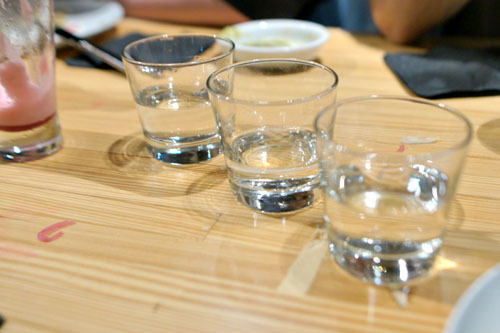 We began with some Minotauro mezcal (3,000L/year production) from Tuitán, Durango that's made from the cenizo maguey. You know you're in some serious company when this non-Oaxacan mezcal is the mildest of the bunch, but that was the case here. The smokiness was still there of course, but there was also a distinct earthy flair to it, along with a surprising smoothness. Also from Durango was La Valentina sotol, made from the non-agave desert spoon. It's the stuff in the huge 14-gallon jug at the bar, and was almost like a more intense version of the Minotauro to me. Finally, we tasted the Tlacuache raicilla, of which only 1,000 litres are produced yearly from the agave Valenciana plant. Hailing from Jalisco, this was probably my favorite of the bunch, with its sweeter, more complex, multifaceted character. Overall, a worthwhile exploration into some lesser known, handmade Mexican spirits--note though, that these craft liquors do not come cheap, each ringing in at $25 a pop. 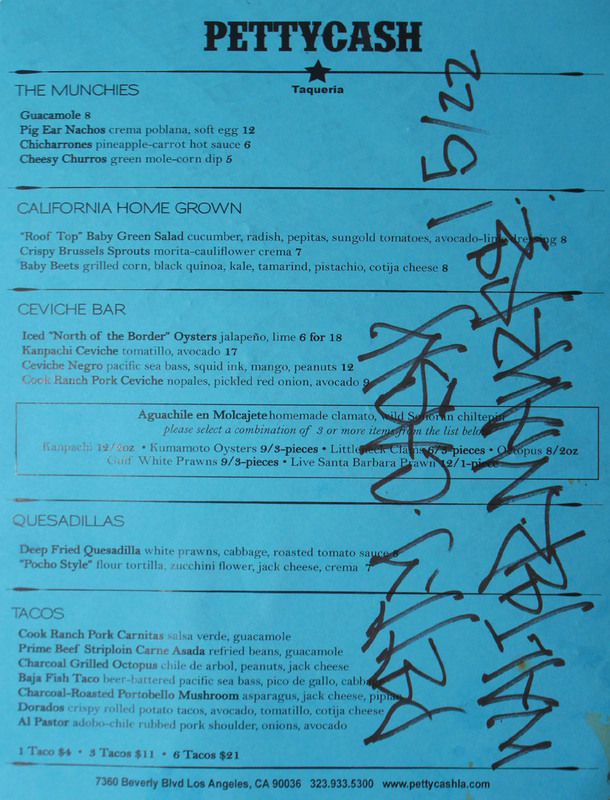 With the tacos dispensed with, we went back to the menu and requested everything that we'd not had already. 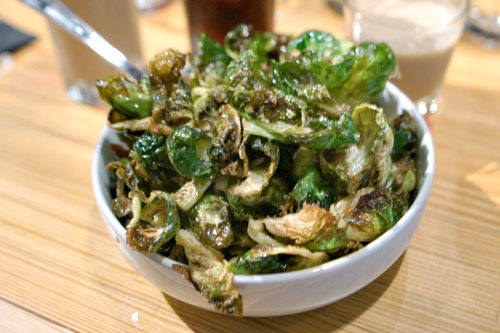 The Brussels sprouts were first up, a commendable preparation of one of my favorite veggies. I loved their almost over-the-top savoriness that transitioned to a brilliant bitterness on the close, with the entire process tempered by the creamy, spicy base of chipotle crema. My only complaint was that I wanted bigger chunks of the sprouts, to better appreciate their texture. 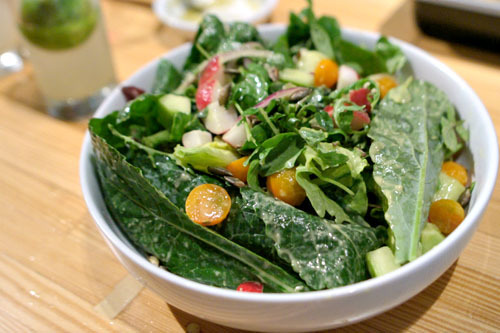 I'm not much of a salad eater, but the version here was surprisingly to my liking. The bright, crisp, refreshing snap of the vegetables was spot on really, a welcomed respite from the heavier flavors that we'd been enjoying. 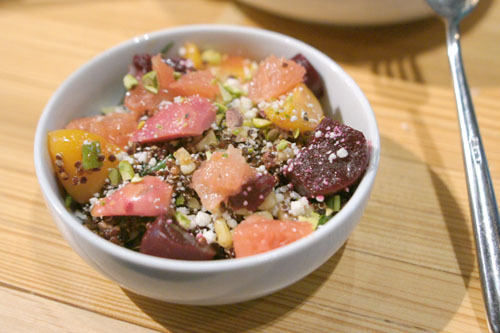 I especially appreciated the nuttiness of those pepitas, as well as the creamy, enveloping tang of the dressing. The Cielo Verde garden lives on! Regular readers will know that I'm not a fan at all of beets, and unfortunately, this didn't do much to change my disinclination. The elements here, individually, made sense to me, but things just didn't come together with the beets as the main ingredient. 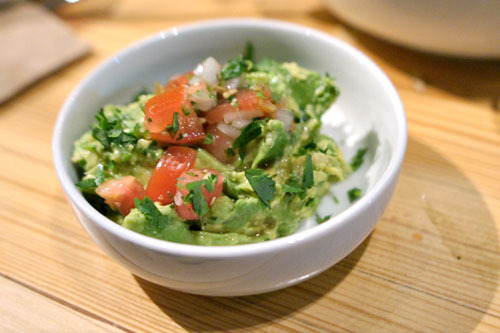 Our final course of the night brought us a near-perfect rendition of guacamole, one that really did a nice job in showing off the avocado itself. I wish we would've started with this! Unfortunately, there's no dessert menu to speak of at the moment, but from what I understand, Margarita Manzke will be implementing one in the near future. That being said, we had to make do this evening with some liquid "desserts." 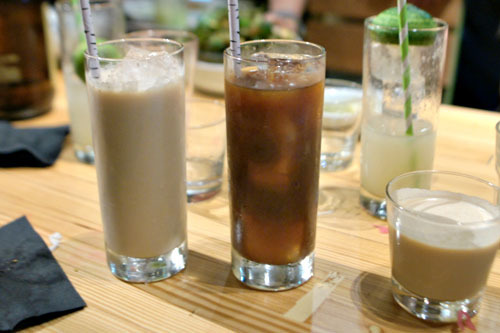 Make sure to get the horchata, as it just might've been the best example I'd ever tasted, with a flawless balance of sugary and spicy that went down so easy. The coffee, as the name implies, was damn tasty as well, and I'm not even a coffee drinker. 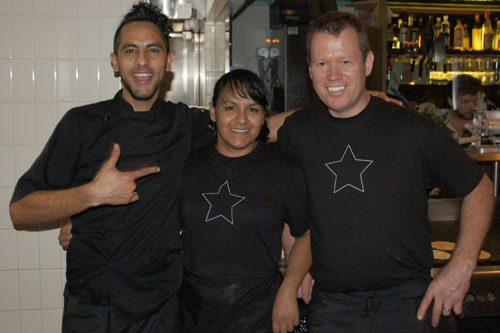 The PettyCash team, comprising Walter Manzke, "Oso" Campos, Bill Chait, and tortilla maestra Marisol. Not pictured: Bill Esparza (who vanished temporarily during the photo opp). I do miss Playa, but PettyCash seems like a worthy restaurant to fill that void. 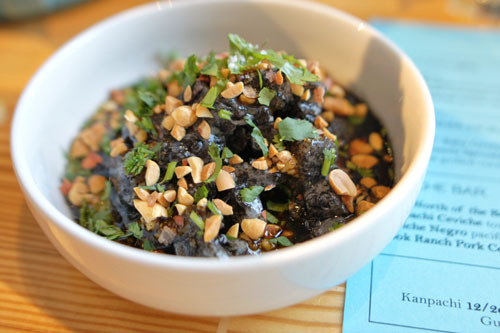 It's more casual than its predecessor, both in terms of the food and the vibe, and cheaper to boot. I don't want to see everybody going in that direction, but for the location, I think it'll do well, sort of hitting a sweet spot that'll hopefully give it a bit more lasting power. Case in point: one of my dining companions said that he wished the place was closer to home, so he could go after work. That being said, some may decry PettyCash as not being authentic, but that's sort of missing the point. It was never Manzke's or anyone else's goal to be truly authentic. 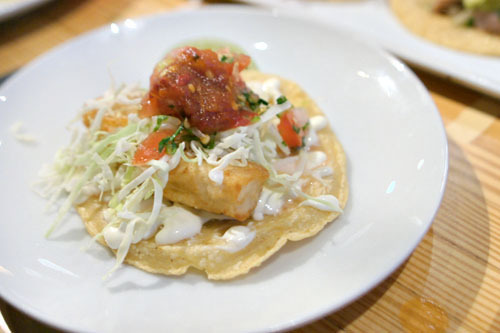 It's more like Mexican-inspired, with varying degrees of inspiration depending on the dish, and in fact, I think the kitchen's at its best and most intriguing when they wander a bit further away from strict Mexican sensibilities. That "improvisation" is what I liked the most about the place, and I'd love to see further exploration of that arena (as well as reservations!). In any case, "Oso" will be here for a few more weeks to make sure everything's going alright before returning home, and as for Chef Manzke, he's still busy at work on Republique, which is slated to debut in the old Campanile space later this year. I hope we haven't seen the last of John Sedlar, either. Are you and Epicuryan now joined at the hip?? LOL! Just wanted to say, I discovered your site after googling for some reviews of restaurants in Las Vegas. Well, I'm hooked Dude. Your reviews are amazing. The pics are superb and the background info on the chefs and their bio's are unreal. You are a God of Food. Look forward to all your adventures and eating vicariously through you. @Anonymous: The god reviewing food, perhaps. I'd be interested in Kevin doing a reversal, cooking dinner for some of the chefs he reviews. I think that would be pretty cool! Wayne: Ha, hardly. Just happened to dine at the same places recently. Anon: I appreciate your enthusiasm, but I wouldn't necessarily go that far in your praise. Anon: I wouldn't hold your breath on that one lol.